This entry was posted in Comments about Cycling on January 4, 2014 by Steve Tilford. It is pretty clear, by now, to anyone that comes here, even intermittently , that I’m not racing any cross now. Since the Master’s World Championships is this weekend in Switzerland, I obviously am not going there. The same goes with Nationals in Boulder. I had planned to race a short cross season. I went out to Southern California and trained for a bit before the UCI races in Louisville, but then was pitiful. Finding out I had shingles, it was a relief. But, I had no idea what it had in store for me. This shingles thing isn’t something predictable. And predictability is something you need in athletics. It has been about 2 months now and my leg is still seized sometimes. Plus, the headaches etc. It’s not nearly as bad as it was a month ago, but it is still something that makes it impossible to train through the winter. I needed a timeout anyway, so I can’t be too disappointed. I had talked to my friend, Ned Overend, a little about still trying to race the Master’s race in Boulder. I told him I didn’t get very much satisfaction out of it. He agreed. It’s not trying to belittle anyone else, but it is more of a relief than a happiness I feel after the races. 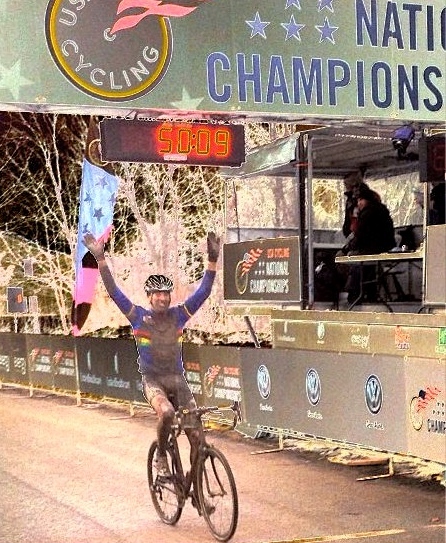 I’ve never lost a Master’s Nationals Cyclocross and I’ve had some pretty awful physical days. If I’m riding good, I’d just rather go and see how I stack up against the Elites/Pros. It is sort of a disappointment I never once raced in the current World Championship jersey I have. I meant to line up in some Master’s race this year, but it just didn’t happen. I wore one for the Nationals Championships, in Madison, last year, so I guess that counts. But, that was last year’s jersey. Whatever. I’m planning to get out of here and make my way to Boulder. I truly enjoy spectating at cross races. It is a learning experience seeing how different riders take different sections. You don’t get to see that much when you’re out there on the bike. Watching last year at Madison, I loved every minute of it. There were sections of the course where a rider would lose 10-15 seconds in 30 seconds. That would have been more than a minute during the race. They must have been making it up somewhere else. It was a very good learning experience. Anyway, hopefully this year will work out better. I need to figure out how much energy I can expend at each point during the season now. It doesn’t work all beat up or ill. Historically, I’ve went through these things, it just seems to drag on quite a bit longer the older I get, which is just part of life. Okay, the guys over at Dirtwire.tv sent me a link to some of their videos from last year’s Worlds. Here’s one below. They have a zillion of videos of cross races, Nationals, Worlds, etc. Click here if you want to check some of them out. This is pretty much how the jersey sat all year. just hanging up. 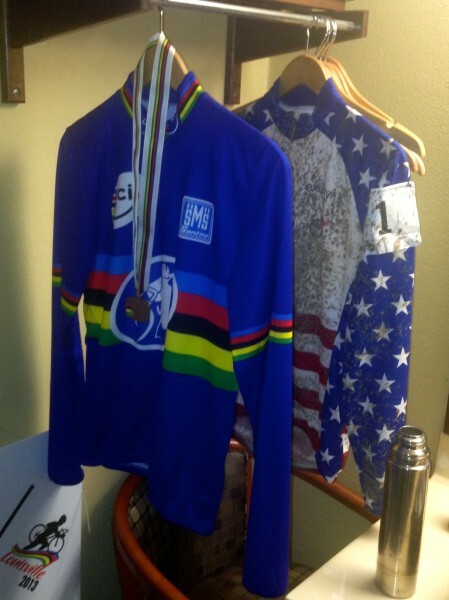 I never washed the US National Championship Jersey I wore at Worlds. Nationals last year in Madison. It sounds like your first priority should be to get healthy and not to continue to beat yourself up. Don’t try to be a hero and beat the crap out of yourself until you get better. Forget Boulder and drive south to Austin and start riding and getting ready for the 2014 season. Oh wait……it is supposed to be down to 18 degrees Monday in Austin…..never mind, carry on.